I love all tutorials that we are fortunate to view, but I absolutely love florals! Congrats on another great book! A signed copy means so much more ... so I am really hoping you draw my number! Adorable addition Marianne....you are pure sunshine! Shading and highlights I think are most important especially for novice artists. I like to watch any tutorials on new techniques I haven't tried before and colour combos that work well! I so hope I could win a signed copy!! I think the thing that gives me the biggest struggle is my limited selection of colors. I know in my mind what color I want, but I won't have it. I compensate by combining a lot of my markers with other color families to get different tones of a color. I am new at the few markers I have and my skill level is low. I love the smoothness of them and am looking forward to learning more. I'd LOVE to have this book...I need all the help I can get! Last but certinaly not least. This has been an amazing bloh hop. I would love to see more tutorials using the blending marker. Thanks for sharing your beautiful card. I would love the chance to learn how to use my Copics to achieve similar results to you. My colouring is very basic so it would be a real thrill to learn properly! I would also love to learn how to achieve the shadowing I see on so many wonderful cards. Obviously I will need to purchase many more markers. Lucky we have talented people like you to show us how.thankyou so much from an envious cardmaker! So excited for this guide! I just started using Copics and I love them. I am absorbing any tutorials I can find! :) Learning about highlighting and shading seem to be my biggest challenges. simple is sometimes more! beautiful my friend just like you! I just received my first copic and used them, so require any help, but think that doing the skin tones and nature scenes would be the most difficult to learn to do properly as am fussy. Love that cutie card! I have the most trouble with large areas and shading...gotta keep practicing my feather blending! Your tuts are always fabulous! I love your card, and I am in debt to you for all of the lessons and Copic tips that you have shareds. I love working with you, and I know I can always count on you to make me smile. Congratulations on a beautiful publication, my sweet friend! Hugs! I'd love to see more tutorials on unique uses for Copics. Any tutorials on shading, florals or blending colors on images are really helpful. Thanks so much! Your card is fantastic....I love learning and especially how to use my Copics...thanks for the chance to win! I'd like to see more about blending. I know I'm not getting the most out of my blenders. As a beginner with very little natural talent, I still struggle with shadowing. I have a hard time understanding light. Thanks for the chance to win a very valuable resource. oh oh oh I would LOVe LOVE LOVE this!! thank you for the opportunity. I would love to see more tutorials on how to create more texture when coloring. I'm hungry for any/all tutorials you create, because learning is fun! I have trouble pairing colored images with DP and figuring out how to match everything. Some days I'll just sit and color images with no rhyme or reason, but then when I try to use them on a card, I can't seem to find a matching dp combo. Your sunshine card just makes me smile! It's adorable! And TSM for the opportunity to win a signed copy of this fabulous book! Gosh so many great cards. I can't wait to see the book. I am always trying to get my shading to look more natural. Thanks for the chance to win the book! Crossing my fingers that my # will be drawn. To win an autographed copy would truly make it a treasured copy! I'm not talented at coloring, so just shading/highlighting are what I still struggle with. Need more practice!!! I struggle with being consistent with my shading throughout the image. I am using your shading/shadows book to help, but tutorials using video really help me. I think the book is very complete, but I would like more tutorials on getting my colors perfect. I know that I can add in a colored layer of warm or cool greys to get a color shade that matches my paper, but I don't really know how to do that. I don't want to make my own marker, just use color layering of my grays to tone down some of my bright colors. That would be great if you could show examples of how to do that. Thanks for asking....I would like a tutorial on coloring Asian themes; highlights are difficult for me. Your tutorials are extremely helpful and I would love to win the book, especially since it's a signed copy!!! I find most people want more info on light source. You have taught that very well in your shadows and shading book...but keep repeating it because its the best way things get into the brain :) I would love a copy if this book. Thanks for the chance to win this wonderful book! I have to say with the few markers I have, the ones I love the best are any from the family of red, as well from the family of purples! Love your card, and a chance to win this book is awesome! I'm constantly searching for new tutorials, especially on creating highlights. I would love to see more techniques on feathering and blending. Especially on flowers. Thanks for a chance to win! I struggle the most with shadows and shading. I would love to see more on that. I am new to the world of Copic. My first need is help with blending. Thanks! I luv any tutorial that teaches me new techniques. I personally feel shading and highlighting is what I would like to see more of! So sweet stamp set. Congrats on being published in the book. I have not seen a tutorial on coloring on papers in colors other than white or cream. How about something like coloring on other colors of paper. Congrats on your new book!! I just received a copy in the mail yesterday but if I win one here I will pass it on to my colouring BFF. I still have trouble knowing where to highlight and shade. I have the books and am hoping to sit down and go through them this summer. The other thing is backgrounds, how do people get such nice backgrounds w/o ruining the image they just coloured?? Is it the difference in the inks or are they just super careful?? I would like to see more on adding depth, shadows and highlights...how to make them consistent. Thanks!!!! Marianne, I definitely, definitely want to win this book SO bad!! I love love love your shading book so this definitely needs to be added to my collection plus to have it SIGNED would be an amazing bonus. Anything you share is a must have. You know I think you are the coloring goddess!!!! I love to try new techniques and am always looking for tutorials for something new. 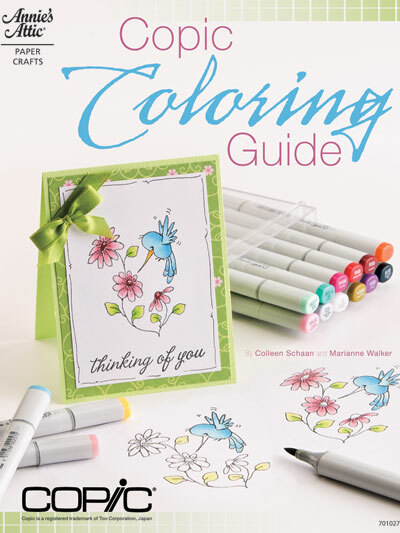 I would LOVE to win this book so that I could improve my coloring skills! I would love to win a Copic Coloring Guide. Autographed would be the icing on the cake! I am always amazed and interested when artists color images of clothing and create creases and draping where to my eyes none existed. I too would love to win a copy of this treasured book! I would love tp learn more about blending colours as I find that can be tricky sometimes. I would like to end up with a more professional look than I have achieved so far! I would also like to learn more about using the thicker nip, as I am inclined to only stick with the paint brush nip. Love, love all your tutorials. I would adore a copy of this book. What I have the most difficult time with is still shading. I'm getting better with the light sources...but it still doesn't look as good as it could...well, that and coloring hair. Who knew hair would cause me so many issues.. it's the flicking.. must be the flicking..
another book.. congratulations... I'm so looking forward to it!! I enjoy coloring anything. I'm keeping cheat sheets on what colors go with skin and which colors blend together well. The book is great. Perhaps a section on fixing mistakes or strategies to hide a mistake in the next book. There is going to be a 'next book' right? This book sounds wonderful! Honestly, I don't own any Copics yet--I feel a bit intimidated by all the bloggers out there using Copics, but maybe after I find the book (or win it! ), I'd feel more confident to try them! So as far as tutorials, tutorials with basic techniques. Thanks for the chance to win! I love the basic ones, as I am just learning, but hopefully I will learn more as time goes by, and be able to do more complex techniques! I love my Copic markers and the thing I love most about them is that they are so user friendly. I love all the tutorials I've seen and they are of great help. Even beginners get great results with them and a little practice makes it all even better. I need to work on my shadows, but I know there are great tutorials on that already, so I just have to keep practicing. I'm a beginner so color choices and shading and highlighting. Thanks for the inspiration! I would love to see more flower tutorials and find shading and highlighting the most difficult. Thanks for the chance to win. I'd love to see more posts on shading and highlighting. I really struggle with that. I would love to see more blending tutorials. I just can't seem to get it. Maybe I overthink it. I dont have any specific requests, unless you are able to find me more time to practice????? Thanks for the chance. I really want this book! What I would love to see more of on your site are the drawing lessons you talked about awhile back. Congrats on the book, you are awesome. My biggest challenge comes from coloring small red objects, and keeping them from bleeding!!! I visit your blog regularly and thank my lucky stars that I found your site when I started my copic addiction! Your work is amazing and your tutorials are a constant source of help and inspiration. Please keep up this great work! Marianne, I love all your blog entries I learned from you and think your the best. Thank you for bringing this exciting fun talent to my world. Oh, boy--am I ever glad I subscribe to your blog--would LOVE to win the book; it's already on my birthday wish list! I would say that I struggle most with filling large areas with smooth, even color blends. Also very tiny areas, due to the size of the sketch marker tip. Thanks for any help! im a brand newbie with copic, and while i have worked with tons of other mediums, im enjoying the markers a lot. i have really limited colors and am looking forward to maybe a tutorial about blending and compensating for that. Love the card the sun is adorable! Tutorials on scenery and colors to use for the sky at different times of the day (especially a twilight sky) would be great. TFS and thanx for the inspiration it has been quite a journey! I would love to see some tutorials on how to create work like Traci Bautista's. Something besides just coloring in line drawings. what a sweet card! i have the most trouble coloring hair, particularly highlights- so i would love more techniques! thank you for the chance to win an autographed copy of the book-so exciting!! I struggle most with consistent light source and getting realistic shading. Love your simple cards and would love to win the book. What a delightful card. I struggle with blending colors and the more I can visualize how it's done properly, the more tempted I might be to incorporate coloring in my crafting. I would like to see project do on, other than paper. I use Copics for jewelry making, glass art, and I even used 100 (black) to fill the toe of my daughters shoe when I was in a pinch. I am just recently Certified and really starting finding out all the cool things that Copic markers can do. I love just reading about them. I am continuing to learn. I did run into one issue. Last evening I was using my Air Compressor and the chisel end of the marker would not air brush, the brush tip end would though. Is this common? It is the first problem I have experienced. Thanks for the chance to win this book. I really want it. I am a visual learner so I would love to see more videos about digital stamps, how to print them what paper and ink to use, etc. I'd love some help in picking colors that should be used together for coloring and blending. I love the beautiful results that Copics can provide when used by someone who knows how. Congrats on the book! Would love toe book! My struggle is with highlights, and dark hair being the biggest challenge! I love Copics and can hardly wait to get my hands on that book! I would love more tutorials showing blending of colors that are not in the same family, also more on shadows. 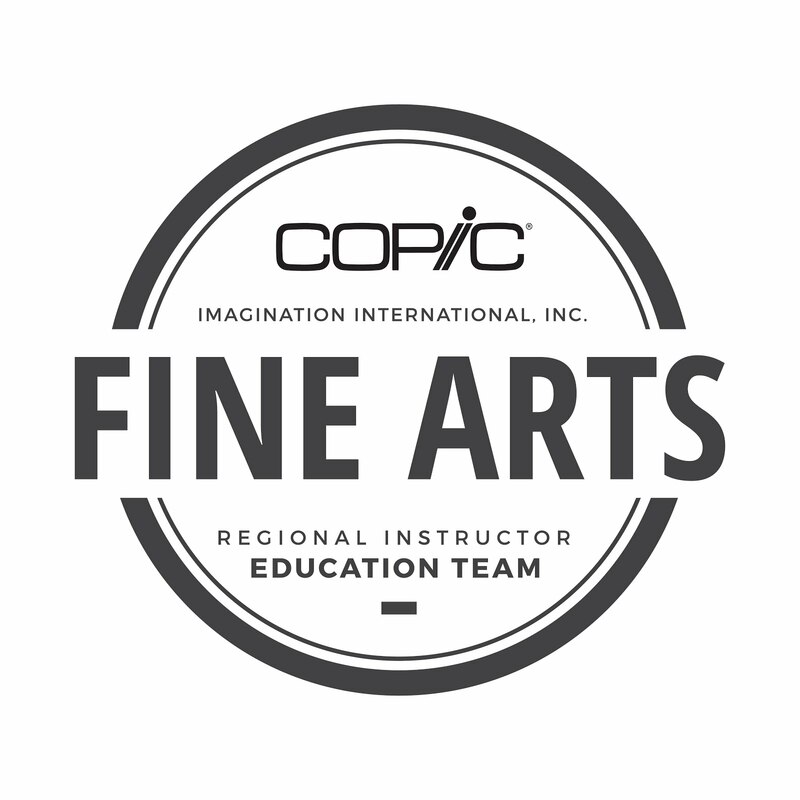 I just got my basic Copic certification in Wichita and am so excited. I was in your San Diego class a few months back. Congrats on the book! Thanks for the chance to win it. Coloring hair and fur are the biggest challenge for me right now. This is adorable, Marianne! LOVE that stamp set! :) The biggest struggles for me are the light source/shadows. Thanks for the chance to win! I'd love to see more tutorials on highlighting. The two things I have the most trouble with are coloring small spaces (using the Ciao and Sketch) and keeping certain colors (like reds) from bleeding. Congratulations on your book! It looks great... 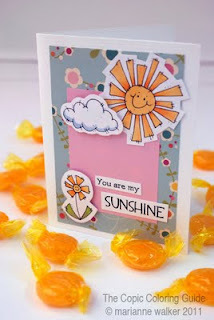 The sunshine card is just way cute! Coloring with reds at times can give me a hard time. They are just so rich in pigment and if I blend too much it will bleed. I'm getting better with it. Any added new tutorial will be great... I always pick up new tips when I watch. I love all the help I can get, but I'd really like to see more on how to figure out what colors go together. Marianne, congratulations on the book, I forgot to congratulate Colleen. You have so many wonderful suggestions for tutorials already, what I would enjoy would be a tutorial on different papers -- that one is pure genius! Also, with autumn being my favorite time of the year, what about an autumn tree with multiple different colors in it? SU! has a beautiful oak tree and I've used floral soft, would love to try coloring it! My favorite is the sweater texture one by the way! Hi Marianne!! I would love to win this fabulous book. I would love my tutorials on light source. That is my biggest problem!! I have been wanting to try Copics for the longest time but I don't know how to use them and I've been too scared to try. Therefore I would be very appreciative of tutorials for complete Copic beginners. I would be so thrilled to win a copy of this book! Your card is such a happy card! I have learned so much about copics by following your blog. I have so much more to learn, tho. Shadows are always a tough one for me, but I think my biggest frustration is figuring out color combos that work. Ones that aren't obvious, like 02, 05 and 07. I know there are so many combos out there, but when I experiment, I sometimes get a muddy look. I am liking your blog! I am new to copic markers. The book would be a great help. I love all the copic colors. Shading and highlighting are always a struggle. Tutorials on new techniques always great! I'm an enthusiastic but definitely beginner to copics and am really struggling with blending, especially with hair/skin shading. It's like I always overblend or underblend, but can't hit that sweet spot. More tutorials on these would be much appreciated. And a signed copy - even BETTER! Thx for this chance. I really like your book. i bought it in PDF format so I would love to win a copy and it will be even better since it would be autographed. I think I would like more lessons on hair and on shadowing around the exterior of an image to make it pop. Thanks for all the wonderful help you give to the rest of us! "Simple and easy" is good, especially for those of us just starting out. I'd like to see tutorials showing how to create beautiful projects with a limited number of markers, 2-3 shades per color group. I love seeing tutorials on shading. No matter how many I look at, I always learn something new or get a little better at something I already know how to do. I struggle with lighting concepts that change the tone of colors (ie night light versus afternoon light, and how that affects how colors look). I'm always working on it!!! I would love more tutorials on mixing the colors. I never seem to get it right. The thing I have the most trouble with is shading and knowing where to put them....if that makes sense. I love my copics and would love to get more use out of them. My biggest struggle when colouring with my Copics is staying in the lines. Not sure why but I have a really hard time especially with the soft tip Copic markers in tight spaces. I guess my struggle is getting the proper amount of shading/blending. I'd like to see another one on coloring people. Absolutely adorable card. My biggest struggle is trying to lighten colors without obliterating them. Color combos and how to shade them are what I need most. Thanks for the awesome book and chance to win. So cute! You are the Copic guru! I always struggle with fleshtones and trying not to leave streaks when I color faces. 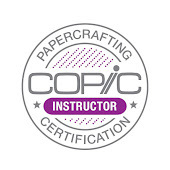 I would also love to see a basic Copic certification class in Honolulu, Hawaii! Please! I love seeing tutorials! I have the most trouble with figuring out how to shadow with my "light source". I just need more practice - I think. Your book looks wonderful I can't wait to see if I win! I am very anxious for an intermediate certification class to come to my area. I am new to the world of copics and have not had a great deal of time to play. Any and all tutorials are helpful! I love your tutorials on doodles. I'd love to see more tricks like the little fish and birds you have in your previous posts. I love tutorials. They really help you learn techniques. I think I would like to see more shadowing techniques. That seems to be my hardest. My most difficult would be keeping my hand light and trying not to press too much. This book looks like alot of fun and good wishes to wins it. Since I am new to Copics, any tutorial on use and just where to begin when you are a beginner is helpful. Looking forward to getting the book to help me. Thanks. I learn the most from everyones tutorials and trying it out for my self. I love it when I see someones work and they share the color combinations that they used to achieve it has been so very useful. It helps me learn which colors work best for shading purposes. Achieving life like skin tones and hair are is the hardest for me. I would also like to see more tutorials in applying shadows. Thanks for this chance to win! I love any tutorial that shows unusual color combos and shading techniques. I love the tutorials on skin color some more of those would be nice. Cute card. Love the sun. I just got 3 flestone Copics and am practicing with them. Any tutorials on shading and blending would be helpful. I would love to win a copy of your book. I am definetly challenged when it comes to creating shadows and would love to see more tutorials on that. Thanks Marianne! I would love to have a copy of the book so that I could use it to help improve my coloring. My biggest challenge is shading an image. I am having so much fun with my Copics, It is so relaxing to color! What a wonderful book it must be! Im always around checking the tutorials and I would love one that shows how to color clothes as it has folds on the fabric. sometimes the basics are the most important! I must not be using the right paper or technique because I struggle with bleeding and smearing. Help! I would love to see more tutorials on blending on smaller items. Thanks for the chance to win. I would like to see more on the airbrush system. Thanks for the opportunity to win a copy of the book. Your card is soooo cute. I would love to learn how to colour animals. Thanks for sharing and the chance to win such a magnificant book. thank you for all the tutorials, hints and tips for using copics! my struggle is trying to match and blend colors. Using the colorless blender by adding a different color to it is difficult for me...i've tried it time and again and the blender will not pick up the ink. Thanks for the book, i hope to win a copy! HI Marianne! I would like to have more tutorials on shading. I just can never seem to get it right. Thanks for this wonderful book! I'm glad to see a simple example, since I'm new at coloring with Copics. I'd like to see tutorials on color combinations, that is what gives me the most trouble, both in my card making and in coloring with Copics. I'm just not very good with colors. I'm very good at mimicry however, so if I see enough examples... I think the book will be a great help! Wow I Love all the tutorials. I have issue with hair. I would love to do the Beautiful things you do that inspire me so much. Great project. Great doing this book know it would be of good use. I need help with light sourse and how to do the background of the image to give it some pop, so it's not just laying on the paper. I have never taken a class and living away from big cities classes are not around small towns so what I have learned I learn from trial and error and videos on different blogs. Thankyou so much for the opporutnity to win this much wanted book! I'm only new but have found that there are lots of tutorials that are very helpful but I can't always be at the computer .. so can't wait to see what is in this book that will help :) It sounds wonderful and I really really really want it! need it! crave it! I just got your shading book recently and it's great. But I'd still like to see a detailed tutorial on doing something like an elaborate gown in intense colors with drapes & folds, showing lots of depth. Hi Marianne - thanks so much for the chance to win a copy of this fabulous book! I'd love more tutorials on colouring things which are pale, shiny, multi-coloured, odd colours etc. Though if I could only pick one I'd love a tute on how to combine colours from different families to create the exact colour/shade you are after. I am a real novice with my Copic markers and really could use help in choosing the correct color value for shading. I'm new to copic markers. While searching the web for information on how to use them I came across your site. Your information was very helpful, I'm slowly aquiring more markers and can't wait to try some of the techniques featured. I would love to see more tutorials on backgrounds! Loving this hop - thanks so much! I'd like to see coloring a background with the pens. So, if the image is a floral, surrounding the design with a color to set it off, like a nice soft blue. Cute card! I'm going to have to get that stamp set! Shading and highlights! I have the most difficulty with feathering. So I definately would like more tutorials on that. Also I would really like to see some more tutorials on coloring hair and skin. The Copic Coloring guide is a great book! I have used it not only to learn techniques, but I get color combo ideas and have purchased some of the stamps that are used in the book. It would be so fun to have an autographed copy!! Such a CUTE card ~ Congrats on being part of this wonderful publication! I would love to see more tutorials on blending....I can't seem to get enough of them! I really struggle with trying to determine what angle the light is coming in, and how to keep everything consistent throughout the image. (I hope that makes sense). I could really benefit from a tutorial on how to add shadows cast by your object....be it a person, a vase, whatever. Thanks for the chance to win Marianne. I would like to see more tutorials on shading. Love your blog and it has help me so much in my coloring with the copics. Thanks for the chance of winning this great book. my biggest heartache is colouring the face especially Magnolia Tilda stamp. I hope there is a tutorial on colouring any of the Tilda stamp. My other greatest obstacle in colouring is placement of shadow. One of the things I struggle with most is creating a lot of depth of colour. I really like a 'watercoloured' look but with copics! Thanks for the chance to win! I am a copic newbie and am looking for ways to practice and learn more. My struggle is with the cost of these markers! I wish I could buy them all -- but I can only afford a small set. Would love a tutorial on how to color skin or shading. Love to watch beginning tutorials. Watch them over and over. Thanks for chance to make suggestions. The shading and highlights are difficult for me and the searching of colours together for excample: 3copics in the colour pink in different numbers. I hope you know what I meant to say because my english is not so well as I wanted so gladly. A fun card! I love to watch all the tutorials about copics. One aspect I think would be helpful is more on using different papers and what to expect as well as shading and how to achieve the best results with a limited palette. This book looks fantastic! What a great prize!!!! W/out a doubt, I struggle w/ coloring larger images. Seems I do OK with the detailed ones. Thanks for the chance- the book looks so awesome & will be a big help! I would love some tutorials on shading the folds of clothing, I often have a hard time getting just the right level of depth. Thanks so much for the opportunity! I'm always trying to learn more about my wonderful markers. Even if I don't have them all. And that book would do the trick. Shading and knowing where to put the "light" is where I find my stuggles. I would like to see more tutorials on highlighting and color combinations. Also how to get the most benefit out of a basic copic set if that is all you have. The tutorials are great and are very helpful. I think I struggle most with visioning folds but I am practicing and continue to advance. thanks for the chance! Your card is gorgeous! Congrats on making it into the book! I always have trouble with shading in general so any tutorial on that is always helpful to me! What a FAB giveaway!! Thanks for the chance! I love all of your tutorials. Everyone is so informative, thanks so much for taking the time to do them. Coloring with blacks and whites to get the glass or black boot effect seem to really give me a great deal of trouble. I am still very new at this so, I am aware I still need to practice. Thanks for the chance to win one of your books, it would be greatly appreciated. Times are hard these days, but crafting keeps me shane. My biggest challenge is the color red. It bleeds everytime! Shading is what I would love to see more of. I love to color flowers! Will give my coloring a try on faces and hair one day soon! I wish to see more tutorials on shadowing. My biggest struggle is coloring with reds. I guess shadows and shading give me the most problems, so I'm always interested in these kinds of tutorials. I love coloring flowers, so shading of flowers is very helpful. The smiling sun image just makes you happy when you look at it. I would like more information on choosing color families. The thing I struggle with the most is the shading and I feel like if I had a better grasp of which colors blend well together it might help my coloring. Thanks for the chance to win this book. I would have to say knowing my light source and keeping this in mind is tough right now. I have not tried anything with skin and hair yet - usually I am doing flowers right now. Thanks for sharing and the opportunity to learn. I am looking forward to getting a copy of this book - a signed one would be even better. Sorry for my english. Copic it's my passion now. But when I have to coloring in white I'm affraid. Thank for helping us. I have a husband, 2 grown sons and 1 grandson (my DIL's are the only other girls in the family) so I don't use flowers & feminine things in my scrapbooking, cardmaking, etc. I'd like to see tutorials using a larger variety of stamped images and definitely more masculine/outdoorsy types of images. I still struggle with blending on large areas, so any tutorial that helps with that. Your sunshine is special. Keep designing. Thanks for a chance to win the autographed book. I am new to copics so have not seen many of the tutorials yet but I know blending will be my biggest challenge. Thanks for the chance to win this wonderful book and I really have enjoyed this hop makes me want to color! Such beauty and inspiration, it takes talent and you certainly have it! Would be great to win your book,signed is a definite plus!!! Thanks for giving me a chance. I would love to get further help with shading and highlights. Also, shadows are kind of difficult for me.Thanks for some great info on this blog. Any tutorial is good at this point. I enjoy the more advance ones not that I'm there yet but to see the possibilities. For me shading from white into a dark color gets me, I am still really new at this though. Thanks for this give away. I love coloring with my Copics & practice all the time. I'd love to learn more about shading & highlighting. Also some tips on coloring/blending on small images as I make mostly cards. All of the tutorials you have done are fantastic. Hair and skin are always ones that you can't have enough of...as well as maybe the air brush system! Love the book as well as your shade one! I am so new to Copics and need to work on my blending skills (or lack of). I'm going to order your book. I love flowers and want to learn the techniques of shading for them. Thanks for sharing! I love my Copics and enjoy any and all helpful hints. One in particular that has saved me a lot of money is using the Copics to color ribbons pearls and other embellishments. What I struggle with the most is the shading. 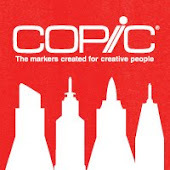 I am forever referring back to the Copic designers' blogs. A guide at hand would be most welcome,especially an autographed one of all my favorite designers!Thank you for this wonderful giveaway. What a wonderful blog hop. determing the light source and where highlighting and shadowing should be from there. I know that with more practice i would be more comfortable with it. Long time follower and admirer of all your work! I love seeing all tutorials and examples you give - each one provides new insight on these fabby markers helping me improve my coloring. The one obstacle I've never been able to overcome is using grays to add shadows to my coloring - I've tried it and usually mess up the project completely. I'd love to see a tutorial solely focused on using grays to tone down colors and give more shadow instead of just darker color to create the illusion of shadow. Thanks for the opportunity to win!!!! It would be great to win the book! Help with color blending and mixing would be most helpful. I love how the Copic markers blend so well. I need more information about shading. I'd love to win a book because noone carries them in the Denver area. What a pain! I would love more tutorials on Hair, Fur, adding texture. I would LOVE to win a signed Copy... I would LOVE to win a Copy.... Thanks for the chance. I would love more tutorials on shading trick. Thank you for a great card example. I would love to win a sign copy of the book. Luv all the tutorials, but once again, shading would be my weekness. I can't wait to see this book. All the tutorials you do are great but my 2 biggest struggles are still blending and shading, so that never gets old. I'm brand new to the world of Copics. Since I haven't really started I'm not certain what my struggles will be. I look forward to learning from you. I struggle with lighting while using my copics. I'm not giving up though, so I'm excited to get tips and pointers from your book.! Good luck.! I'm still struggling with shading and shadows! I've taken the class and am signed up to take it again. Can't wait. I have the Shades and Shodows books, but would love some hands on instructions for that. I learn best by seeing rather than by reading. Love your card; love the book, and would love to have a signed copy. I can target both questions with one answer. I always struggle with what colors to choose for correct shading/ highlight combinations, and how to purchase combinations. I love all the tutorials! My challenge is trying to smoothly shade small stampings and doing animals. Some stamps already have fur indications so it gets more confusing to try to add anything else to suggest furriness. Keep the tutorials comin! Love them and so learn from them. Thanks for the chance to win a copy of your book!